I awoke this morning to the rumblings of a thunder storm and the excitement of a day in our jammies; the first day of Spring Break! As I think about our upcoming week, I commit to making this not just another Spring Break because it isn’t. 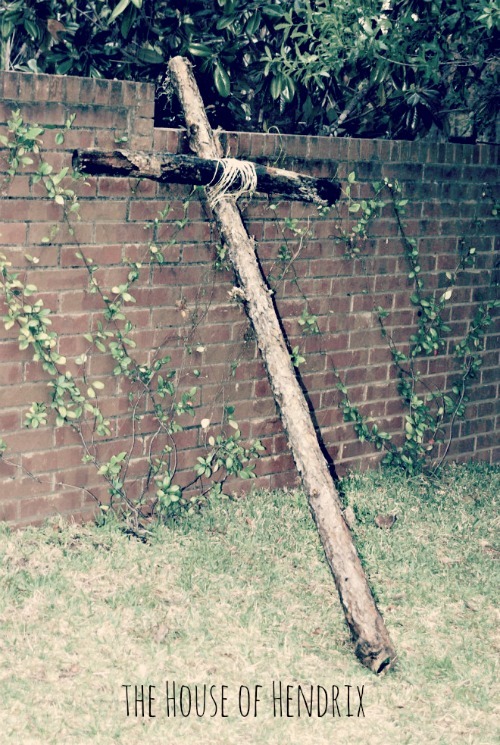 This is a week in which we remember Christ’s suffering on a cross and His resurrection. Jesus knew it was His last week on earth. If you knew it was yours, what would you do? Doesn’t it make you want to read the scriptures of that final week to see what Jesus did? I’ve been rereading Max Lucado’s book called “The Final Week of Jesus” which walks you through just that. So this is my challenge, how can I prepare my heart and home to receive, and see clearly, all God wants to teach us this week? I have planned a different activity for each day of this Holy week. Today we start. “The soldiers wove thorn branches into a crown and put it on his head. “Matthew 27:29 “They mocked him and spit on him”. 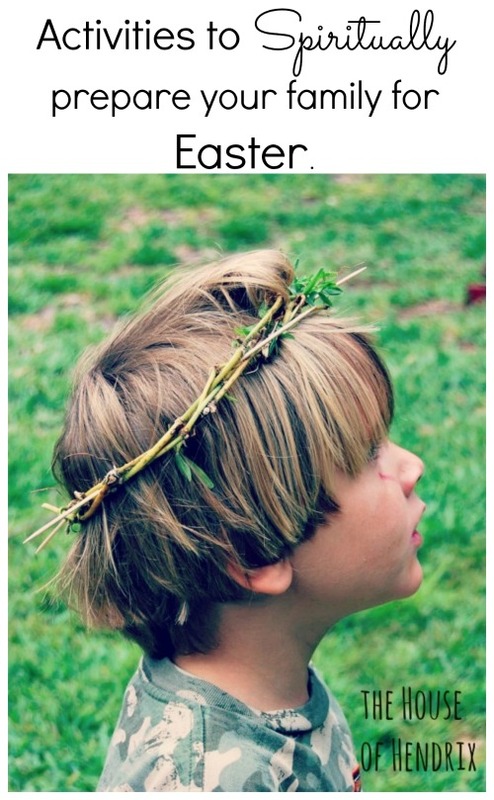 When I think of a crown of thorns, I like to imagine it differently. I don’t like to think about the blood dripping down Christ’s cheeks or the piercing sensation of constant pain. I ask “What it means to suffer at school? Has anybody ever spit on you, hit you, insulted you?” How did you feel? Why did Jesus have to suffer? 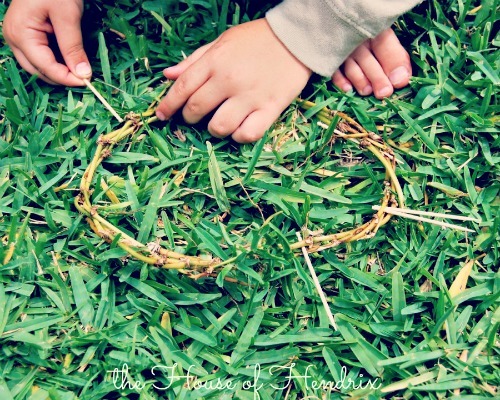 We pull up grass from the ground and weave it together into a crown. We pierce it with our sin, toothpicks. The kids are both eager and reluctant to put on the crown. A few minutes later, Campbell hurts his elbow. He comes to me sprinting. There was nothing I could do, but he wanted me to know his suffering. We are each going to experience periods of suffering. I take comfort knowing that God knows my human suffering first hand. 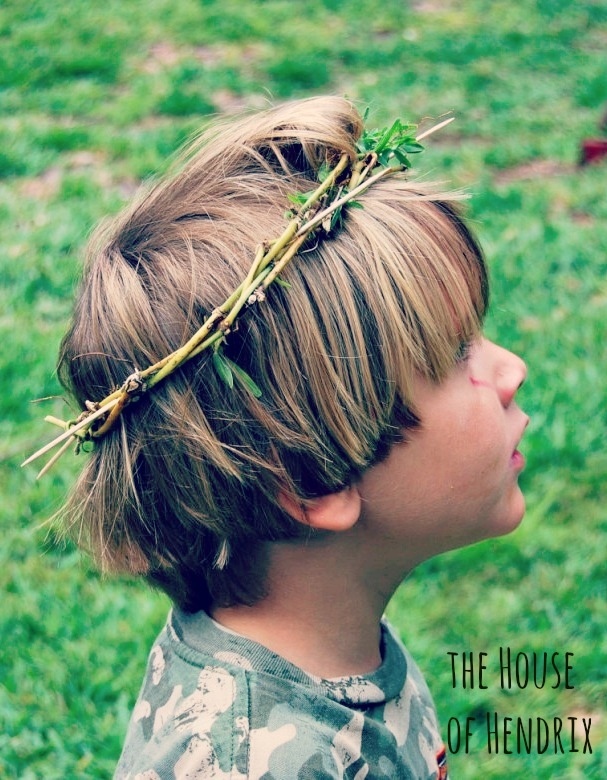 It’s Palm Sunday, a special day in our home because it is the source of our son’s namesake. When I was pregnant with my 3rd, with no agreed upon baby name, Lily came home from school waving a palm frond. She explained that the people waving palm fronds as Christ entered Jerusalem were called “palmers”. I went into labor on Easter and our Palmer was born the next day. I was inspired by an idea on Pinterest this morning called “Get rid of 100 things this weekend”. Yes! Simplify our surroundings. Clear the clutter so that we can breathe…think…hear. This is where our family is starting; a practical exercise in simplifying. I explain to my crew that God desires to be seen by us. He wants to be heard but sometimes our crowded and cluttered lives distract us from His voice. We discuss the idea of simplifying; cutting back the stuff to make more room for God. I propose the challenge. Can we each find 100 things to give away? It can be clothes, toys, books, toiletries. We set up bins for donations, consignment and garbage. We crank the music and begin. About a month ago the forest immediately behind our home caught on fire. We watched as the fire moved from hundreds of yards away onto our property. As it crossed over our brick wall, I was advised to grab what I could. A reverse wind came blowing the flames in the other directions permitting just enough time for the firemen to push it back. For a week the tall pine trees sizzled and smoke filled our home, but we were thankful. 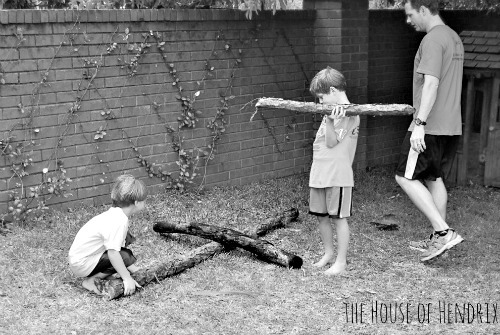 For today’s project, my husband and children hopped the brick wall towards the burnt remains. They found the perfect logs. 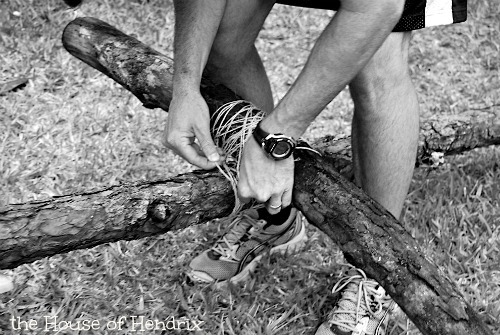 With rope and humility, Jimmy ties the ash stricken trunks together. The mid-afternoon sky turns black. The skies thunder and gusts of wind begin blowing. We all race inside later learning tornadoes were passing over our area. We talk about the parallel between our afternoon and that Friday in Jerusalem so many years ago when the skies turn black and the earth shook as Christ died. This cross, made from the ashy wood which absorbed the fire that could have destroyed our home, is now a physical representation of not only God’s sovereignty over our family but the freedom to live because we are not bound by our sin. This activity came from my children’s school. In an empty egg carton, place 12 plastic eggs. Within each plastic egg, put a symbol about the Biblical story of Easter. purple cloth = they mocked him by dressing him in the royal color. nail = He was nailed to the cross. dice = The guards threw dice to gamble for Jesus’s clothes. rock = to cover the opening to the tomb to prevent Jesus’s body from being stolen. Empty Egg – the resurrection egg. Empty because the tomb is empty. After reading the Passover Story in the Bible, my children decided to “Wash the Feet” of a beloved teacher as modeled by Jesus during the Last Supper. Read that experience here. This is quite a powerful activity, particularly for the person receiving the washing. 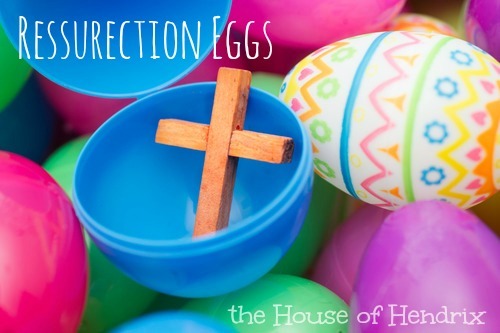 I just found this printable over at Detail-Oriented Diva and loved the idea of using the egg colors as a spiritual lesson. As you dye your Easter eggs, use this chart to talk through the “colors” of Easter. You can print it over here. May your Holy Week prepare your hearts for the celebration of Easter. I’m thankful for my readers. If this post resonated with you, you may share it using the buttons below. If you would like to connect further, please join our Facebook community and sign up for future posts here. This entry was posted in blog, Easter and tagged character-building, Easter, holiday, Kids. Bookmark the permalink. Thank you so much for this. I found it by accident and will be back. It’s exactly what I needed. I’m really loving the theme/design of your blog. Do you ever run into any web browser compatibility issues? A small number of my blog visitors have complained about my site not operating correctly in Explorer but looks great in Firefox. Do you have any recommendations to help fix this problem? Wonderful. Just what we needed. Allison, might you be able to give some insight on how to give some new fire to our church for the kids. Our Awana has really gotten stale and the junior high is dealing with a really rough crowd of unchurched outside kids coming in for ministry. Help! Thank you, Deb. Yes. Email me at [email protected] and I can direct you. My sister has an entire ministry just for this. I can link you up. Thank you so much for this post it is beautiful and just what our family needs to prepare our hearts for Easter. Thank you! 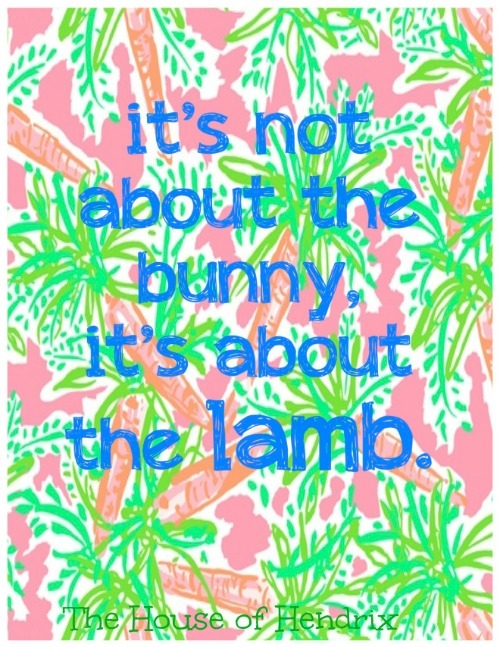 What a great way to remind our kiddos of what Easter is really about when we live in a society where it has glamorized it. The beauty is in the lamb and suffering of the sacrifice. I love it. Thank you again! This was an inspirational read. Thank you so much for sharing your creative ideas and wisdom. Blessings from down under! I love this so much. I love that you made dying Easter eggs meaningful and not just a distraction to the true meaning of Easter. This is a wonderful post, I’m out of time this year, but I’m hoping to do this with my family next year! Thank you!